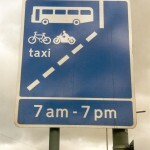 MAG Ireland recently highlighted the opening of additional bus lanes to bikers in Belfast. On this side of the border, the authorities continue to bury their heads in the sand on this issue and bikes are legally excluded, not just from Bus Lanes, but also from the recently introduced Bus Gate scheme in Dublin city center. This resulted in the farcical situation where bikers were forced to dismount and push their motorcycles through while cyclists faced no such restrictions. MAG Ireland has long campaigned for motorcycles to be legally allowed to use bus lanes based on the principle of segregating vulnerable road users from dense urban traffic. It’s the reason why pedestrians have footpaths and cyclists have cycle lanes. Uniquely, we in Ireland have a situation where it’s left up to the discretion of the Gardai tasked with enforcing road traffic laws at the sharp end whether or not to prosecute motorcyclists for using the bus lanes on a case by case basis. In general, Gardai tend to ignore riders using bus lanes provided they are travelling at an appropriate speed and showing due consideration to other road users, particularly cyclists. When motorcyclists are stopped they are often issued with a verbal warning rather than a ticket & a fine. This situation has arisen because it has been custom and practice for motorcyclists to use bus lanes since their inception. The vast majority of Irish riders understand the logic behind using bus lanes, and use them in a safe and considerate manner. Everyone involved understands that it makes sense for bikes to be in bus lanes, except of course the authorities responsible for their management. In light of the recent decision by Belfast to allow bikes into more bus lanes, we’re asking you as riders for your views. The initial results of the MAG Ireland quick poll on this topic show some 95% (19 out of every 20 people who responded) are in favour of legalising the current situation.